Milta Vargas stayed in her abusive relationship for five long years, so she knows full well the cycle of domestic violence: From ‘tension-building’ to ‘crisis’ and finally to ‘honeymoon’, and then back again. And again. And again. She also knows why women and men stay in abusive relationships, which makes her an expert in her job as Domestic Violence Coordinator at the Springfield Police Department. There, she uses her experience, empathy and skills to guide victims through what can be a long and painful process. Vargas recently joined her fellow DV Advocates Suehaley Arce and Jennifer Rivera in an unusual training program for the entire Springfield Housing Authority staff, held at 60 Congress St.. From administration to clerks and custodians, SHA staff gathered in two sessions to learn what domestic violence is, how to spot it, and how to help. 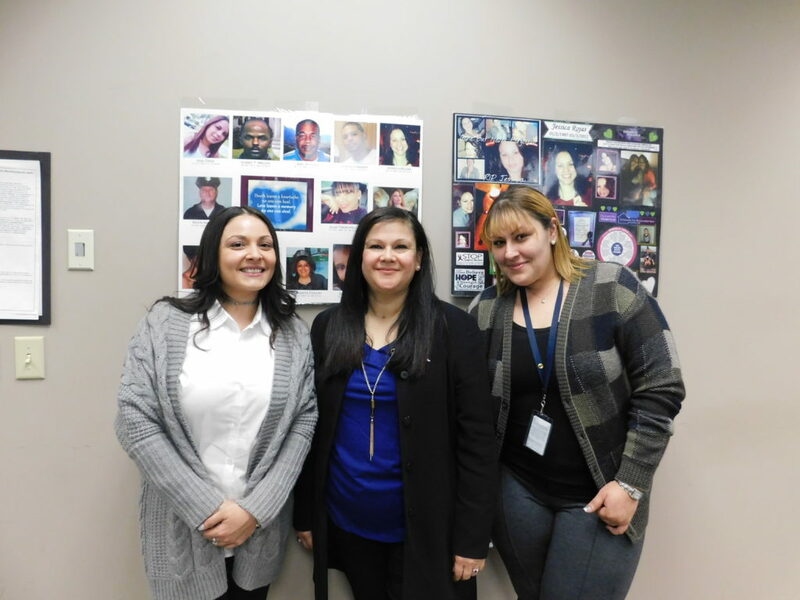 Springfield Police Department’s Domestic Violence staff from left, Suehaley Arce, Milta Vargas and Jennifer Rivera, at a staff training session at Springfield Housing Authority. For Vargas, the sessions were a trip down memory lane, and not of the happy variety. She stayed with her abuser through attacks and beatings, abuse on her children, lies, betrayals and more. Always, she felt trapped. And always, fearful of losing her four young children. Thirty years later that experience and those memories propel her to always see her work through the eyes of the victim, and to reach out with a gentle approach. 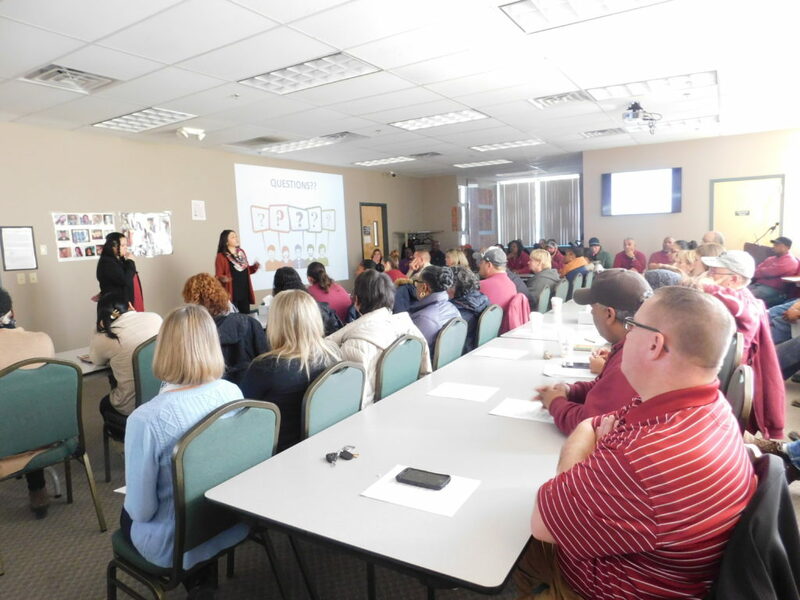 For SHA employees, 160 in all, the sessions were an eye-opener that will help many in their work, and possibly in their outside lives. SHA Executive Director William Abrashkin said he found the session he attended to be compelling and potentially useful to the staff. As a former Hampden County Housing Court judge, he is well aware of the scope and breadth of domestic violence. SHA staff members listen attentively at the domestic violence training session by the Springfield Police Department. 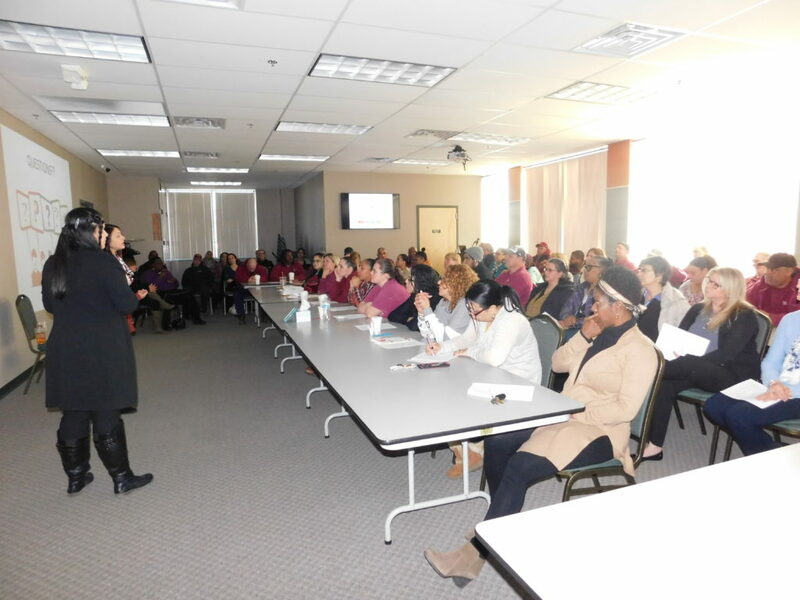 The training sessions were organized by SHA Public Safety & Investigative Services Director Rosa Lebron, who said she wanted all staff members to be aware of domestic violence, what to do about it, and what to avoid. SHA staff learned how to spot domestic violence, and how to safely respond and offer assistance. SHA employees agreed that the presentations were powerful, giving them tools to spot abuse handle it appropriately, which in many cases requires a soft approach. SHA’s Talk/Read/Succeed! Outreach Coordinator Zenaida Burgos said she found her session to be “very informative. Executive Office Administrative Assistant Marieli Roman said the session may have been painful to hear, but necessary. 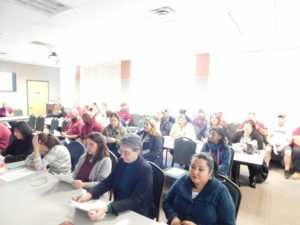 SHA staff members said they learned a lot at the training provided by the Springfield Police Department. “It was raw and that’s just what we need to gain the necessary perspective to help those that may be involved or exposed to domestic violence,” Roman said. One in four women will experience domestic abuse in their lifetimes, with some 1.3 million victims each year in the United States. Males can be victims as well, with one out of 14 men assaulted by their partners – and they are far less likely to report abuse due to the stigma. Abuse can be verbal, emotional, financial, sexual, and physical, or combinations thereof. Both children and adults are impacted physically, emotionally and cognitively by domestic violence. Children who grow up with violence are far more likely to leave school early, and to be violent themselves, both when they are young, and when they grow up. Property damage is a frequent casualty as well. It takes victims on average seven tries before they leave for good, meaning contact with friends, family and outside people must be handled with care and understanding. Victims often feel ashamed and guilty, as though they are the ones at fault. How can one help? The Police Department team offered advice on this question, including offering compassionate support, active listening, validation of feelings, options, safety planning, resources and respect for choices made along the way. 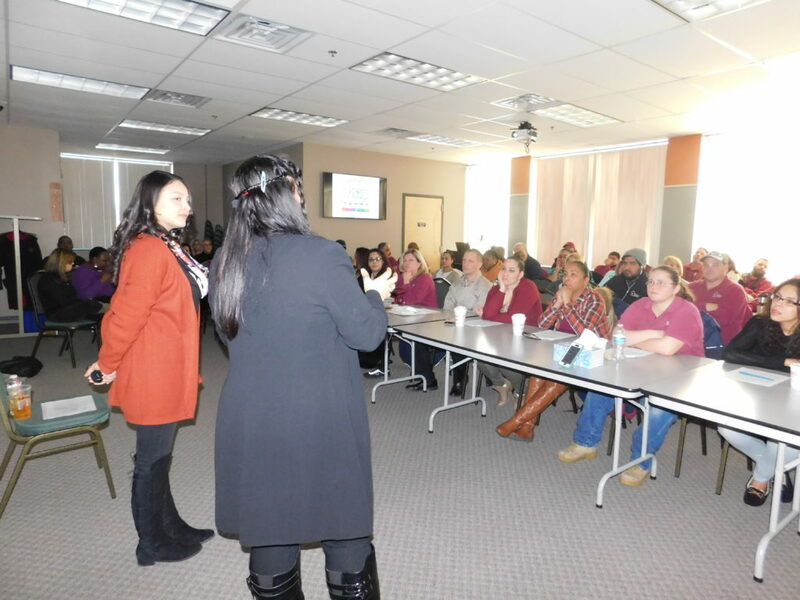 Springfield Police Department Domestic Violence staffers Milta Vargas, who is coordinator, and Suehaley Arce, share their knowledge to SHA staff members. Things to avoid include pressuring victims to leave and being doubtful or judgmental in any way. Restraining orders can protect victims from abusers and harassment in general. Police must respond to all domestic calls, must remain on scene until safety is assured, must help victims to obtain medical treatment when needed, and must advise all parties of their rights. They must also document incidents, and they can also assist victims to a safe place. The Police Department telephone numbers for domestic violence issues are 413-735-1519, and 413-735-1520.